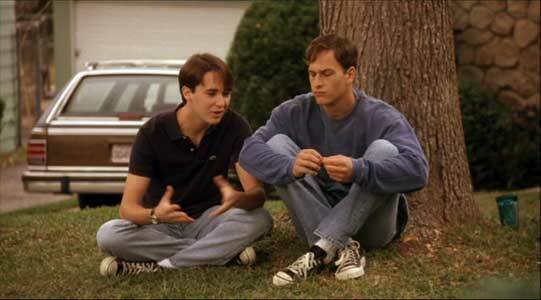 Josh Charles, Wil Wheaton, Brian Davila, A. J. Merton, and Jesse Stock wear black and optical white high top Converse “Chuck Taylor” All Stars in the film. 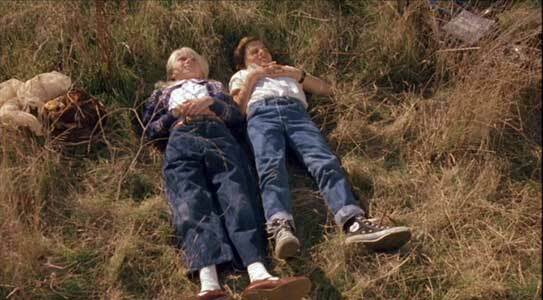 Josh and Amy have an on and off again romance in Pie in the Sky. Pie in the Sky is the story of Charlie Dunlop (Josh Charles), a young man growing up in a town somewhere north of Los Angeles. 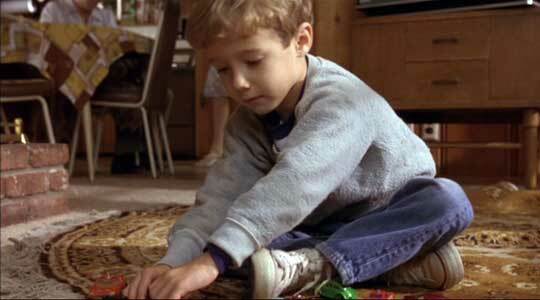 Charlie’s main interest in life is traffic, and even at age 4 we see him continually playing with cars. This is initially explained because his parents (Peter Riegert and Christine Ebersole) think that he was conceived when they were caught in a traffic jam. As an adolescent and teenager, Charlie spends a lot of his time studying the traffic patterns of the vehicles passing on a nearby freeway, because “there’s nothing more beautiful than traffic”. He becomes so expert at understanding local traffic patterns that he can actually predict when a specific car or truck will pass by. His room is filled with traffic signs and a lighted map that he uses to track freeways throughout the west and the current location of his idol Alan Davenport (John Goodman), a radio traffic reporter whose broadcasts he continually monitors. Like Charlie, Alan truly understands the relationship between man and traffic, and Charlie wishes to follow in his footsteps. At age 4 Josh was already obsessed with traffic and wearing chucks. At age 10, Charlie meets Amy (Anne Heche), a neighbor of the same age. They start to develop a friendship because Amy is the only person Charlie has ever met who is understanding of his traffic hobby, but just as their relationship starts to become closer, her family moves away. The summer after their high school graduations, Charlie and Amy meet again when she visits her cousins in Charlie’s town. At first tentative, their relationship suddenly re-ignites on a beautiful August day in the woods, and the couple becomes romantically involved in the last few days before they are to go off to college. Although they vow to stay together, they end up breaking up after a Thanksgiving reunion at Amy’s parent’s house. Charlie has always been tentative about relationships, and is hesitant to make any permanent commitments especially after he accidentally discovers his father cheating on his mother. Amy and Josh have their first romantic moment in the woods at age 10. After college, Charlie lands a job selling insurance, but suddenly out of the blue comes a letter from Alan Davenport granting him an interview with Metro Traffic in Los Angeles, where Alan is now Los Angeles’ top traffic reporter. Dropping everything for this great chance to work for his idol, Charlie moves to a Hollywood rooming house and begins lobbying Traffic Metro for a job. To his great astonishment, Charlie discovers Amy working in a local coffee shop while pursuing her training as an avant-garde dancer. Charlie tries to rekindle their romance, but Amy remains aloof, and is dating another guy. Disappointed over her rejection, Charlie ends up having an affair with his landlady (Christine Lahti), who is much older. Charlie’s big moment in his career occurs when he accidentally meets Alan Davenport in the men’s room, and impresses him with his photographic memory of great radio moments from Alan’s broadcasts. Alan decides to hire him as an assistant, and Charlie finally realizes his dream of working in traffic reporting. The confidence Charlie gets from this gives him the courage to express his true feelings to Amy and try and win her back. The remainder of the film deals with their on-again off-again relationship, conflicting career goals, opportunities, set-backs, and dreams, and how they finally decide to resolve things. Amy tries to distract Charlie from his obsession with traffic by dancing on a freeway overpass. Writer/Director Brian Gordon has produced an enjoyable light romance with some whimsical characters. Josh Charles’ portrayal of Charlie makes him seem like a very normal, nice person, and his two obsessions — Amy and traffic — give his character an interesting dimension. Anne Heche gives Amy a quirky edge, as you might expect from someone whose ambition is to work in modern dance, and she has a grace and style that Charlie greatly admires. The opposite personalities of this unlikely couple provide their relationship with a different type of chemistry than you would expect in a Hollywood romance. The story gives you some insight about how people who want to pursue very different individual goals can mature and grow close over the years, once they learn to be accepting of one another. Also noteworthy are the performances of John Goodman as the egotistical Alan Davenport, Christine Lahti as Charlie’s Latin music loving landlady and unlikely lover, and Peter Riegert as Charlie’s gruff father. Charlie tries to talk long distance to Amy while his dad tries to sleep on the couch. Jack tells Charlie about the facts of life when it comes to women. Pie in the Sky is a story about romance but it also is the story of a real chucks guy. Charlie is shown wearing chucks throughout his life, from his first pair of white high tops at age 4, through his adolescent years where he is seen wearing black high tops, and as a college student and young adult continuing to wear black high tops when he is not wearing a business suit at work. Charlie’s friend Jack (Wil Wheaton, Brian Davila) also wears chucks — black low cuts as a kid and black high tops when he is older. 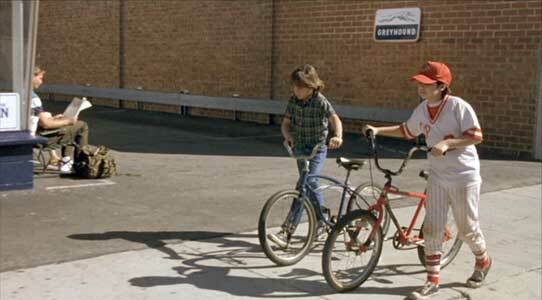 There is a great romantic sequence when Charlie and Amy first get serious about their relationship, and a funny bit where Amy and Charlie are seen dancing on a freeway overpass, but the best closeup shots occurs in the scenes where you see Jack and Charlie talking about girls when they are ten years old and later when they are college students. Ten-year-old Jack talks to Charlie about women. Pie in the Sky. (1996) Josh Charles, Anne Heche, John Goodman, Peter Riegert, Christine Ebersole, Wil Wheaton, Brian Davila, A. J. Merton, Jesse Stock, and Christine Lahti. Directed and written by Bryan Gordon. Categories: Romance, Drama, Sexually Explicit.